Q:	Where did you get the idea for KING BONGO? 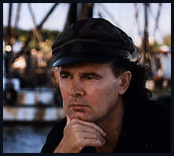 A:	When I arrived in Florida in the early 1980s, during the aftermath of the chaotic and massive Muriel boatlift exodus from Cuba to Key West. Q:	Were you writing your Key West novel, MILE ZERO, then? A:	Yes. One of the main characters was a Cuban-American of profound character, centered by his historical roots. Originally, there was to be an entire back-story involving another, more conflicted, character who came to America after the turmoil of the Cuban Revolution. That character was King Bongo. Q:	Why didn't King Bongo appear in MILE ZERO? A:	King Bongo was too big, a novel unto himself. His drama was best played out directly against the crucial decade of the 1950s in Havana. Q:	What is it about 1950s Havana that continues to fascinate and fire the imagination? A:	Havana was an international Riviera then, a world famous watering-hole, a jaded capital of vice and gambling, a hell-sink of misery for the poor, a racially divided society, a place where corruption flowed faster than rum and Mafiosos licked their chops and chomped their cigars while revolutionaries slept with a rifle in one hand and dreamed of a reformed society. Q:	Is that what you wanted to capture? A:	That is the popular American conception of Havana. I also wanted to portray a sophisticated and educated middle-class trapped in the jaws of fate. Q:	Do you consider your Havana an accurate portrayal? A:	My fictional Havana is the result of a collision of personal and historical facts, resulting in a metaphor intended to transcend time and place. Q:	Then yours in not intended as the real Havana? A:	What is the real La Habana of the 1950s? It is a place of remembrance and dreams shaded by personal recollections and revisionist interpretations. Cuban-Americans and Cubans I know, those who were jailed in Havana for their political beliefs, both before or after the revolution, those who lost everything after they fought to free themselves from Batista's dictatorship, those whose children were airlifted to America in Operation Pedro Pan, those who are true believers in the revolution and continue to support it, all conjure a different Havana of the 1950s. Q:	It must have been a challenge to pull a novel from these opposing points of view. What made you think you could do it? A:	My life has been intertwined with Cubans and Cuban-Americans since I was a school boy up to the present. I've known the children of privileged politicians, Batista crooks and cops, actors and artists, exiles, prostitutes and thugs who worked the Mafia hotels and casinos, Fidelista guerrillas in Central America and Bay of Pigs vets, desperate boat-people refugees, middle class professionals, on and on. They all have different stories, opposing facts, singular realities. In fact, Cuba has become a collective fiction, a mirrored corridor of paradise found, lost or betrayed, depending on your perspective. Q:	In ways, your character King Bongo, half Cuban and half American, straddles the myriad worlds of Havana. Bongo is warned in the book, "You'd better be careful that the American half of you doesn't get the upper hand." How is Bongo a reflection of America's involvement in Cuba? A:	The blood of two cultures runs in King Bongo's veins, his innermost conflict is reconciling the two cultures that war within. Part of his struggle is not unlike ours of today. How do we square the runaway machinations of a money driven mania with the mundane meaning of our lives? How do we protect the profound freedoms and intimate celebrations that make life worth living? Q:	Is this why Bongo is told, "No matter how much the tide changes, the country will always need you! You've got the rhythm! You're the King of the Bongo! Without music, we die!"? A:	Bongo embodies music's primal emotional expression. Music is central to the novel, from nostalgic Cuban boleros to Broadway show tunes, to American rock and roll; all represent the pulse of the character's lives. The 1950s saw the advent of the portable transistor radio, for the first time people were able to take their music with them, to orchestrate the soundtrack to their own lives. My use of music is intended as personal contrapuntal beats to the larger notes of the novel's theme. 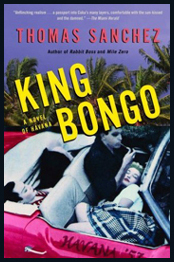 Q:	Critics have called KING BONGO an "epic noir." Is that what you intended? A:	There is a tradition of the Gran Noir Tropique, a literature of themed moral and philosophical posturing set in a hot place, as I say in KING BONGO, "where the sun has melted every promise." Of course, this is all funneled through a singular central point of view, that's what makes it intellectually lively, the intended myopia that reveals competing realities. Q:	Does the 'Gran Noir Tropique' include Camus', The Stranger, Malcolm Lowry's, Under The Volcano, Graham Greene's Latin and Asian books and the Los Angeles works of Raymond Chandler? A:	Those works are known, the territory has been covered. I was more interested in deconstructing the anticipated execution of the Noir Tropique, to subvert its perceived pose of shady people in sunny places, in order to arrive at a platform from which today's reader could enter. We've been bludgeoned by notions of politically and sexually correct stances. We need not reinterpret a past epoch from our current perspective, but rather find hard darlings of individual truths that existed in distant cultural galaxies. Q:	Then your Havana of the 1950s is to be interpreted more as myth than as fact? A:	Emphatically, yes. Today's accelerated sense of history is tainted by commercially packaged notions of the quaint and the retro. I wanted to blow up the bridge between the then and the now, explode the righteousness that there is only one legitimate interpretation of a text and its historical time, to light up the mysterious shadows and dramatic angles of an alluring world that still draws us, like moths to a flame, to the Havana of the 1950s.